The Form Fit Thumb Spica 3-dimensional molding technology allows us to vary padding thickness in strategic locations for superior comfort and fit. XSmall: 5 1/4" - 6 1/4"
Small: 6 1/4" - 7 1/4"
Medium: 7 1/4" - 8"
The clinic gave me a bivalved cast post-surgery on my thumb. The cast is totally inadequate for physical activity, doesn't completely protect the thumb, and is uncomfortable. They were really unhelpful. 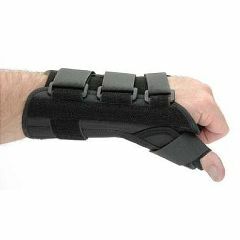 This splint was recommended by an orthotist and works great for hiking and mountain running as well as just switching it out for the cast. I would repurchase this product. Sturdy. comfortable. Easy Storage. Safe. Lightweight. Because it allows minimal movement, the pain subsides quickly and allows me to heal faster for the next days activities. When I get home from work, I put it on and wear it throught the night. Easy Storage. Sturdy. Safe. Lightweight. Affordable. Perfect fit. Tendinitis of the wrist. dequervains. Daily confort. Following Surgery. Average Health. Patient. Professional. Athletic. Excellent replacement for bulky custom fit braces that may cause disconfort to wear. Helps relieve your pain while sleeping without worrying about tossing and turning disturbance.